From the title of this story, you might expect that I will be describing my experience of learning how to take off and land an airplane. Not so – in fact there are no landings in today’s story. In my next story “A Tale of Two First Solos”, you will read about how I mastered the art of landing an airplane. In Welcome to Oshkosh, I wrote about our first arrival at AirVenture and taxiing to the spot where we would be camping for the next week. The next while was spent positioning the airplane, tying it down and setting up our campsite. Since we were inexperienced campers, we had fortunately purchased one of the new “Easy-up” tents. It works a bit like an umbrella, as the poles open out from a central point at the top of the dome and, there is a mechanism there that, once snapped into place, holds the tent open. We had it set up in no time, fastened to the ground with the ropes and tent pegs that were provided. Camped next to us were AirVenture veterans Newell, Kay and their daughter Jenny, from Minnesota. We were lucky to have them to guide us, as we were totally unprepared, logistically. We had brought a cooler, but that was the extent to which we had considered the meal situation. Newell and Kay showed us where the closest restaurant was – a Hardee’s – and told us about the grocery store and other restaurants a bit farther away. They also explained about the shower facilities and the transportation options. Off we went to Hardee’s for ‘dinner’, a delicious, mega-fat, fast-food experience. Hmm, we would have to go farther afield the next night to find something more compatible with our normal diet. After dinner, we went to the grocery store to buy ice and breakfast food. By then, we were exhausted and ready for our first night in a tent. We slept beautifully! On Monday morning, we awoke refreshed and excited about AirVenture’s opening day! After a quick breakfast at the campsite, we donned our sunscreen, hats and walking shoes and headed towards the flight line! We had noted in the schedule that a Corsair (Jeff’s favourite airplane) would be arriving at 10:00 a.m. As we approached the flight line, Jeff caught sight of the Corsair. We ran like hell and got there just in time to experience the Corsair’s fly-bys and landing. To me, the Corsair was just an airplane, but I was getting caught up in the excitement of the moment and laughed with delight when the Corsair did a high speed pass. I glanced at Jeff to share in his reaction and was surprised to see him wiping his eyes! Totally out of character – he was more excited than I was! Even better, go to Oshkosh! After our first full day of AirVenture, we were exhausted! We had sore feet and we were starving! The sky was darkening, so we wisely grabbed our rain ponchos before heading out to the Mexican Restaurant that Newell and Kay had told us about – a 15 minute walk. While we relaxed over a delicious Mexican meal, we could see the sky getting darker and darker. Then came the rain, followed by wind and thunder and lightning. By the time we had finished our meal, it was raining hard and it was quite dark, as the sun had gone down – oops, forgot the flashlights! We put on our rain ponchos and went out into the rain. As we approached our section of the campground, something looked not quite right. As we got closer, we realized that it was the porta-potties that were about 20 meters from out campsite. In the row of a half dozen porta-potties, only two of them were still upright – the rest had been blown over! 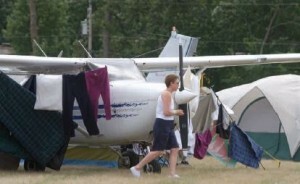 Then we rounded the tail of our airplane and at first, we did not see our tent. Where did it go? Oh, there it was! But instead of being a dome shape with the dome at the top, our ‘easy-up’ tent, although still attached to the ground, was turned inside out, like an umbrella. The tent was full of water. Our air mattress and duffle bags of clothes were almost floating in the bowl of water. Fortunately, the ‘easy-up’ mechanism had not been damaged and we were able to get it back up again, so we at least had a roof over our heads. We slept in our only dry clothes – the ones we were wearing, directly on top of a bare air mattress. Daylight revealed that we had fared better than some. The next day, we actually saw tents in the garbage dumpsters and we heard stories of people sleeping in their airplanes. Newelland Kay described how they had laid on their air mattresses with their feet up against the poles of the tent to prevent it from collapsing. The day was hot and sunny, so we went to Target and bought rope and clothes pegs and strung the clothesline between the wings, struts, propeller and tail of the airplane and hung our clothes and sleeping bags out to dry. Jeff also reinforced the tent with additional ropes to prevent a recurrence. By that evening, we were back in business and we stayed dry for the rest of the week! Great article again Lesley. I will be looking to you for instructions about where the restaurants are just a15 minute walk from the aircraft camp grounds.